The Breville BBL605XL Hemisphere Control Blender is a heavy-duty blender with a diecast metal base, stainless steel blades, and a round mixing jug with a 48 ounce capacity. This blender features a bowl & blade system that is designed to draw ingredients from the top down to the bottom so you will be able to thoroughly mix your ingredients every time. The Breville BBL605XL was designed to be both easy to use and easy to clean. There are five different speed settings and three additional task functions so that you can do a number of different jobs by simply pushing one button. There is a convenient LCD timer that works great with your preprogrammed settings which will automatically change the speed of the blender for optimal results. The mixing jug is BPA free and is dishwasher safe for easy cleanup. When researching reviews for the Breville BBL605XL Hemisphere Control Blender we found nearly 60 reviews online and this blender received an impressive 4.4 out of a possible 5 stars. One customer said that they’ve used a number of different blenders over the years and the Breville company seems to have an edge over their competitors. This person also said that this particular blender does a fantastic job and it is also a nice looking machine that you can be proud to leave on your countertop. Customers that reviewed the Breville BBL605XL agree that it does a great job making smoothies and can easily process fruits and vegetables as well as easily being able to crush ice. One customer said that it can chew up an apple, a pear, a chunk of fresh ginger, ice cubes and several handfuls of greens without any hesitation. Another customer says that the most useful button on this machine is the one that turns ice cubes into a soft, snow like consistency. This is great for making smoothies, iced coffee, or other frozen beverages. This person also said that they used the Breville BBL605XL to make a cream of broccoli soup and it did a great job. Most customers also agree that the Breville BBL605XL is very easy to clean. Most other blenders have a base that unscrews from the mixing jar. You would need to clean the base, the blender assembly, and the rubber washer separately and then you have to clean the jar and the lid as well. With this particular blender the entire blending mechanism is attached to the jar and is dishwasher safe. 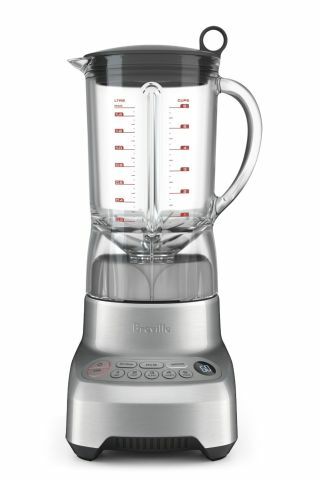 The Breville BBL605XL Hemisphere Control Blender can be purchased for around $200. It is by no means an inexpensive blender but it costs less than half of what a Vitamix or other high-end blender would cost but it is still able to get the job done. After researching all of the reviews online and seeing how happy customers are with their purchase, we would highly recommend the Breville BBL605XL Hemisphere Control Blender.